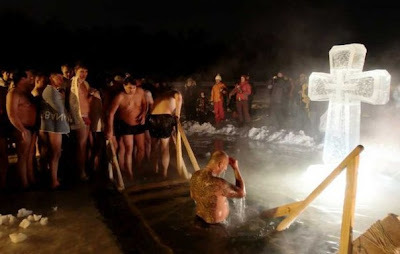 Mass ice swimming takes place on the Russian Orthodox Epiphany on Jan 19 every year. This tradition has been practiced in Russia for centuries. The Epiphany is considered to be of the greatest feasts for Russian Orthodox beleivers, and every year they plunge three times into ice-cold water in honour of Jesus's baptism in the river Jordan. Nominated for Russian book of records, this year swimming is going to be the most considerable of all the preceding in St. Petersburg. The swimming starts at 15:00 in front of the Peter and Paul Fortress.